View More In Bows & Ribbons - Page 4. 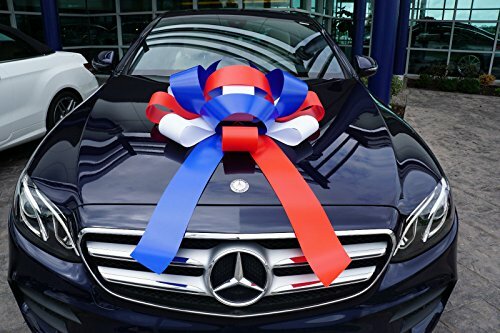 Make Their Gift Extra Special with our exclusive 30" Large Magnetic Car Bow! 30" wide Large Car Bow. Made of Weather Resistant / Waterproof Vinyl. No Assembly Required. Non-scratch magnetic base. Delivered anywhere in the USA in 1-5 days. Size : 30" wide with two 30" long X 4 ½" wide tails. Color : Red White Blue. 30" wide Large Car Bow. Made of Weather Resistant / Waterproof Vinyl. No Assembly Required. Non-scratch magnetic base. Delivered anywhere in the USA in 1-5 days. Material : Vinyl. Size : 30" wide with two 30" long X 4 ½" wide tails.Color : Red White Blue.